Seashells have been a symbol of good luck. In the East, seashells are used as one of the emblems of Buddha. Many people like to hold seashells against their ears to hear the sound of a pounding waves. In the early days, this sound of the pounding wave is interpreted by sea surfers as a link between those people at sea with those left behind on land and therefore people considered seashell is a lucky charm that can ensure a safe return from a voyage. Next time remember to bring a seashell with you when travelling abroad. Your fate (or destiny) is like a river. You can sit around and let the flow of the river takes you where ever your final destination is. Or you can go upstream against the water flow and reach the destination that you want to be. Many success people are born poor and illiterate. Yet they become millionaires or billionaires. They work against the odds. They had bad days. If they had resign to their own fate, many of them will still be poor and illiterate. If you are fated to have a good life, what happens when you take a knife and go around killing everyone you see in the broad daylight? Your destiny immediately changes. Instead of enjoying your good life, you will either be hanged or jailed for murder. Your destiny is make up of your belief, your past decisions and your past karma. Your destiny is therefore created by you. If you take massive actions towards your goals, you will eventually ended up where you want to be. The golden rule about fate : Learn your fate but don’t resign to it. Take massive actions to change your destiny. It is believed in many parts of the world that if you carry a chest nut in your pocket, it will bring you good luck. In addition, a chestnut in your pocket will help you cure your headache, backache and even chest pain. Life is filled with unhappy events. Think of a unhappy event in your life. Perhaps you have a argument at work. Perhaps you are scolded by your boss. Perhaps your children are disobedient. Think about the unhappy event for a while. Now tilt your head downwards until your chin almost touch your chest. Do you notice a sore feeling somewhere at your chest or at your stomach area? Why? Whenever you think of something unhappy, you transform that thought energy into an energy in your physical body. As long as you don’t release this energy, the energy will accumulated in your body until it finds a way out. Some people vent the energy through anger. Others released the energy through ulcers and illnesses. There are many ways to release this energy without hurting yourself or others. One way is Emotional Freedom Technique. EFT is a method created by Gary Craig to release the negative emotion that is within you. You can release your headaches, migraines, fear, anxiety and even your phobia. Other people also use it to achieve goals, aid their recovery from illnesses and loose weight. Think of a feeling, headache or pain you want to release. You may have a headache or a craving for food. If you are to give this feeling a number from 1 to 10 (1 is lowest and 10 is the worst), which number will you give? Remember this number. Formulate a sentence using "Even though I ……………….., I totally and completely love and accept myself. An example is "Even though I have an headache, I totally and completely love and accept myself." Shorten the sentence in part 2. For example, if I want to clear my headache, my short sentence will just be "headache". Now tap on the side of the hand at the "KC" position while repeating the sentence in part 2, three times. "KC" stands for "Karate Chop". Next tap on the positions on your face in the order (EB, SE, UE, UN, CH) and your body (CB, UA) while repeating the short sentence in part 3. You need to tap at least 7 times on each point. Repeat step 5 as many times as you want. I tend to repeat step 5 at least three times. Now examine your feeling, headache or pain. Now give it a number from 1 to 10. Is it better? If you have not reduce the feeling or pain to a level you want, you can repeat the whole process again. EFT is created based on the same theory as acupuncture. Instead of using needles in acupuncture to tap into your meridian in your body, you are using pressure to do the same. At first I am doubtful about EFT. I tried on my headache and immediately I reduce the pain. I tried a few times a day for the next few days and now my headache no longer bothers me. If my headache comes back (maybe due to my diet or stress), I will use EFT again to tap it away. Try it to believe it. For a long time, it is a custom is to shower the wedding couples with rice. This custom started in older China, where rice is always considered as a symbol of fruitfulness. The Europeans used wheat instead of rice during the middle ages in weddings. The wheat used had the same meaning as the rice. Nowadays, bird seeds are used in wedding because it is less wasteful. No matter what is used, the wish for good and abundance is the same. Everyone of us need to juggle many things in life : work, family, health, friends, and money. Keeping all the balls in the air all the time can be difficult because you and me only got 2 hands. Everyday we only get 24 hours. On bad days, 24 hours seems to be too long. On good days, these 24 hours is too short for us. 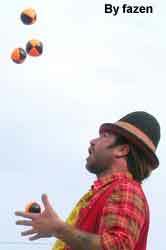 So how do you juggle the balls in your life correctly? If you examine the balls, you will notice some of the balls are make of rubber and others are make of glass. Balls of family and health are make of glass. If you drop them, they are broken. Always seek to keep these glass balls in the air all the time, whether you have time or not, whether you like it or not. Other balls like work are make of rubber. You loose your job, you can always find another one. You loose your friend, you can find another one. You loose some money, you can also earn it back. These rubber balls can bounced back when you drop them. In my opinion, the priorities in life should be like this. Health comes first. You need to do something everyday to maintain or improve your health. Without health, you can achieve nothing in life. Without health, you cannot take care of your loved ones. That’s why health is so important. Family comes next. If you think that family is no good, perhaps you never had any major setbacks in your life. When you have work problems or major health problems, you will find that a family is where you can fall back on. A family is also someone whom you can share your happiness with. Without someone to share your joy with, your happiness is not happy at all. Money comes next but not the last. Other balls like friends will come after money. Money is needed to maintain the first two priorities : health and family. I feel that by maintaining the priorities in this order, you will get the most benefit out of life. If you are unhappy about your life, look at how you prioritize your balls in life or which are the balls that are missing in your life. Now that you have done step one to five. You know what you want. Your goal is so attractive to you. You have a plan of mini steps to take to reach the goal. So what is the final step? The final step is to do it. Action is what that create the world. If God just think about creating the world, do you think the world exist? You must take at least one mini step everyday towards your goal. The reason why you create mini steps of 15 minutes or less, is to let yourself feel comfortable about taking one step at a time. If you do one step per day, you will have done 30 steps in a month. You are 30 steps closer to your goal. You can do more steps on days when you are more motivated but you need to do at least one mini step per day. You also need to review your plan weekly or monthly. This review will bring you more insight of where you are now and where you are heading. You need to make adjustment if you are moving in the wrong direction. This review is critical to whether you can achieve your goal or not. Good luck to whatever you want to achieve. Let’s make this year different from your last year. Let’s make your goals a reality. If there is no obstacle in life, then life will not be fun. Obstacles are there to make your life fun. If you think about obstacles are there to spice up your life, you will be happier and feel more control over your life. Anyway, the obstacles will be there whether you get angry at it or just laugh at it. You, yourself are the greatest obstacle. If you are not motivated to achieve your goal, you will never make it. Make sure the goal is what you want and not what others want for you. Don’t include goals that your boy friend, girl friend, family or parents want you to do. You must do a goal you want for yourself. Using EFT (Emotional Freedom Techniques) to remove unwanted emotions about achieving the goal or doing that mini step. You can download a free ebook on how to do the EFT at the following address. EFT also help you to remove mental obstacles such as you don’t deserved the goal or you have a fear of change. The reason why people always do the same things is because there are some advantages in doing it. One possible advantage for being poor may be you hate rich people or you have a fear of success/failure. One possible advantage of being fat is you don’t like party or you fear of change (changing your wardrobe, changing your life style). Only when you feel good about your goal, you are unstoppable. When you find yourself stuck, it is good to ask someone who has achieve the same goal. Don" ask someone who label themselves an expert but they never achieve the goal you want to achieve. Don’t ask an weight lost expert who is fat himself. Don’t ask which car to buy from a person who don’ have driving licence. Search the forum in the internet for advice. When no one can help you, God can. Napoleon Hill, the famous author of "Think and Grow Rich" mentioned that many successful people have very strong religious background. When these rich and successful people meet with obstacles, they turn to God for strength and solution. Have faith in God. Don’t expect immediate result. God has so many people to take care of so your answer may come a bit later. So you have a plan. Now how to get the energy to achieve your goal. A plan without motivation energy is like a car without petrol, it will not get you any where. There are a few ways to energize yourself. Think about how you feel when you have the final result. Think about how you feel and do when you have the money or have the dream car or slim down. Don’t think of the actions to do to reach the goal because thinking of the work you need to do is boring. Everyday day dream about your goal. Paste the photo of your goal in front of you. Paste the photo at your desk where you will see it everyday. If you want a car, paste the photo of your dream car in front of you. If you want to loose weight, paste the photo of the dress in front of you. These photo will remind you of your goals and give you the energy to take action. People are creatures of emotion. When we don’t feel like doing something, even God cannot make us do it. Emotion Freedom technique is a well known skill used by many people to remove unwanted obstacles, feeling and pain. You can cure your headaches, phobias with it. The good part is it is free for you to use. You can download the ebooks from the following link. Try it to believe it. I guarantee EFT works. Affirmation may not be new to many people. You unknowingly say affirmations in the morning, before you go to bed and throughout the day. When you wake up and brush your teeth, you affirm "Today is a lousy day because I feel so bad". When you get a speeding ticket, you affirm "I knew this will happen to me". When you get caught in the traffic jam and you are late for your work, you affirm "Everyday is like that". When you go to bed at night, you affirm "Tomorrow will be another lousy working day". No wonder bad things happen. Why not affirm positive things. One popular affirmation is "Everyday in every way, I am getting better, better and better". You are too negative. You cannot expect to do a few days of positive affirmations and erase off all your negative thoughts you have accumulated for years. You need to do it more often and for a longer period of time to have any positive effect. You need to affirm with feelings. When you affirm bad things, you affirm them with feelings and that’s why the negative affirmation works. In the same way, you affirm the positive statement with positive feeling and it will work too. Use affirmation with EFT. Another more advance free ebook about using EFT with choices is available at the link below. The affirmation works better with EFT. When your boss tells you to finish the 200 pages report by today, you will say it is impossible. Even if you agree to do it, you will not be willingly to do it because you know that it is not possible to do so. The same is applied to goal setting. If you tell you mind, you want something unreachable, your mind will not be willing to reach it for you. You will not find any reason to do it. So how to make your goal seems reachable even it is a very big goal? How do you eat your meal? You eat one mouthful at a time. How do you read a book? A page at a time. Slice up your goals into mini goals. Then slice up the mini goals into mini steps of 15 minutes or less. Now look at each mini step. Do you think you can do one mini step now? Of course you can. You feel you can. You think you can. Why? Each step only take 15 minutes and therefore you are confident of completing it. Look around you or search the internet for anyone who has achieve what you want. You will feel a goal more achievable if someone else has achieved the same goal. This is especially true if the person is close to you. If your father is a army general, you will likely to feel that you can also be a general. If your friend has successfully loose weight, you will feel you can also achieve your ideal weight. If you read about someone in the internet like Louise Hay who can cure herself of illness and help others to do so, you feel you are ready to be cured. If you can get more how-to information about your goal, you will feel that you can achieve it because you already know the how-to. Search the internet or look for books on how to achieve your goal. Knowing how-to is winning half the battle. Know what you want. Know where you are now. Now plan the steps from where you are to where you want to be. That is called a plan. The best plan is a written plan. As you are not going to achieve the goal within one day, it is best to write down a plan so that you can know the next step. Another important question is how do you know that you have reach your goal. Having a goal to loose weight is too general. How do you know if you have achieve the goal to loose weight? Perhaps fitting yourself into the dress you want to wear, lets you know that you have achieve the goal. You must know what will tell you that you have reached the goal.